The ThINKin' Spot: Welcome To The Funny Farm! PK-122 Funny Farm to be exact! 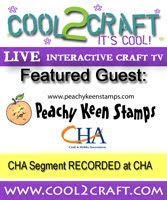 This is one of the new releases from Peachy Keen Stamps, and I completely LOVE IT!!! Lots of inspiring cards and pages will be created using this stamp set. The card stock, ribbon and patterned paper are all part of the Peachy Picks Kit for the month of July. Oh how I adore these kits, because they make creating so much easier. Everything is coordinated to perfection! I stamped this image with Memento Tuxedo Black ink and colored with my Copics, and the little farmer's head is popped up on dimensionals. I thought it would be cute to put his head on an Action Wobble, but I couldn't get it to fit. Would anyone else besides me like to see those in a smaller size? I love me some Action Wobbles, but would really love to have a smaller size for such projects as this one. Maybe someday... who knows!! Enjoy 13% off site-wide, and orders over $13.00 (after discount) will receive a FREE Mini Ghost stamp! You don't need to add the Mini Ghost to your order, or enter any coupon code, your savings are automatic, and your FREE stamp will automatically be added on your order of $13.00 or more. Thanks for stopping by The ThINKin' Spot today! Have a happy Friday, 13th, or not and enjoy a blessed and beautiful weekend! Happy Stamping!! What a fab card Lorie!! Love this new release! Thanks for sharing and have a GREAT Friday!! Adorable card. I wish I could colour as well as you. I love these stamps too. What a fun card, Lorie! Peachy Keen Sneak Peek Day and SALE!